Nora Roberts is BACK!! OK, I know many of you didn’t realize she left, but over the last few years her newer books have not cut it for me. I found several of her latest stories full of filler and irrelevant content, and the core stories suffered as a result. But in The Witness the story was tight, the characters interesting, the romance swoon worthy, and the suspense totally believable. Everything tied together, just like a great story should! 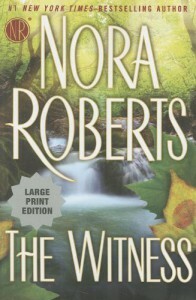 I never thought romance suspense was Ms Roberts best genre, but she nails it in The Witness. The story is told in two parts. At first as we learn about the events that lead Elizabeth Fitch into a witness protection system at age 16, and then it fast forwards twelve years later. Elizabeth is now living as Abigail Lowery and trying her best to stay unnoticed. But Brook Gleason, the new sheriff in town, becomes very curious about this mysterious lady and proceeds to turn her world upside down. The heroine Elizabeth Fitch/Abigail Lowery is such an unusual heroine type. A genius daughter of a neurosurgeon, her entire life was mapped out for her. In a fit of rebellion at age 16, she becomes a witness to a gruesome murder by a Russian mofia organization in Chicago. Believing she can trust the system to protect her, she nearly loses everything. Brooks was also a smart cookie, and recognized signs that made him suspect Abigail is running from something. When his charming but tenacious drive for information is combined with a meddling hippie free-loving mother, Abigail slowly begins to trust him. There were so many facets to this story that stood out, it is hard to summarize them all. Watching Abigail learn to trust, and therefore truly live her life for the first time was wonderful to read. Brooks devotion to her was heartwarming, and their time together full of passion and heat. The suspense was brilliantly done, and never felt over the top. The book never suffers from bad-guy overload either, we get just enough to know they are there and what they are capable of doing, but the main focus is on Brook and Abigail staying safe. The ending was pitch perfect! Like I said, I didn’t think romance suspense was Ms Roberts best genre, but I am now eating my words. This was really well done. I would have looooooooved a longer epilogue (about the size of this book, to be honest, but I know that is totally unrealistic.) I didn’t want to let these characters go. I would have liked if it had one particular twist in the end, but in truth it would have made the ending less spectacular, so Ms Roberts ended everything perfectly. Warning – Spoiler about the ending! I really wanted her mother to finally grow a heart and re-enter Abigail’s life. When Abigail is in the hospital near the end of the book, I hoped her mother would come in wearing a scrub outfit and they’d reconnect. All the way to the end I was hoping the mother had an explanation for her actions, but alas the woman had no maternal instincts in her. So the book ended perfectly, and my farcical hope of a mother-daughter reunion was not to be had. 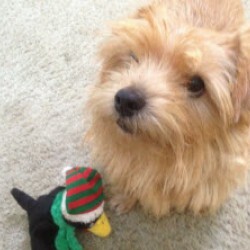 I had the great pleasure of listening to this story on audio. The reader (Julia Whelan) is simply fantastic. One of the best narrated books I’ve listened to in a long time.